Giant eyes help fireflies detect flashes of their mates. As the nation prepares to have a devil of a good time celebrating Independence Day and watching fireworks, Bug of the Week is delighted to report on the continued renaissance of Mother Nature’s own diminutive pyrotechnic experts, lightning bugs, in the Washington-Baltimore area. After a spotty appearance several years ago, bug geeks and happy kids agree that this is shaping up to be a remarkable year for lightning bugs. On a recent nocturnal safari in my backyard in Columbia, MD, low lying vegetation and trees were bedazzled by a galaxy of twinkling fireflies. What a spectacle! Over the past few years, many people have been concerned about dwindling numbers of lightning bugs in our region. While hard data on this issue is difficult to come by, some suggest that urbanization, with its destruction of natural habitats and proliferation of brightly lit homes and buildings, has disrupted the normal ecology and behavior of these remarkable creatures. Others believe that, because lightning bug larvae live in the soil, the widespread use of residual insecticides to treat lawns may have contributed to the decline of lightning bugs over the years. Perhaps unfavorable weather cycles or a dearth of food for predatory lightning bug larvae may have suppressed their numbers in years past. While we may never pinpoint the exact suite of factors that govern the ebb and flow of lightning bug populations, we can surely enjoy their bountiful return this year. With unusually warm weather this spring, lightning bugs made their first appearance in our area in May and their activity has been an ever-building crescendo over the last few weeks. Lightning bugs, also known as fireflies, are not true bugs like stink bugs or squash bugs. They are actually soft winged beetles. The miracle of their eerie greenish-yellow light comes from a remarkable chemical reaction in cells lining a specialized light organ found in the beetle’s abdomen. Cells called photocytes contain a chemical, luciferin, that, when combined with oxygen by an enzyme called luciferase, releases a burst of light. Unlike light bulbs in our homes, this process is so efficient that almost no heat accompanies the light and firefly flashes are termed cold light. Glowworms patrol the soil in search of worms, slugs, and other soft-bodied invertebrates that are their prey. Lightning bug larvae also produce light and go by the name of glowworms. These juvenile monsters hunt snails, slugs, and soil dwelling insects. The primary function of the adult’s flashing light is to signal other members of the species. Usually, the male lightning bug flies and flashes a characteristic pattern to woo a potential mate waiting below in the grass. If a female likes his show, she flashes a response and the happy couple mate. In addition to supplying sperm to fertilize her eggs, the male also provides a packet of rich protein used by the female to provision eggs developing in her ovaries. This nuptial gift is important for the reproductive success of both male and female. 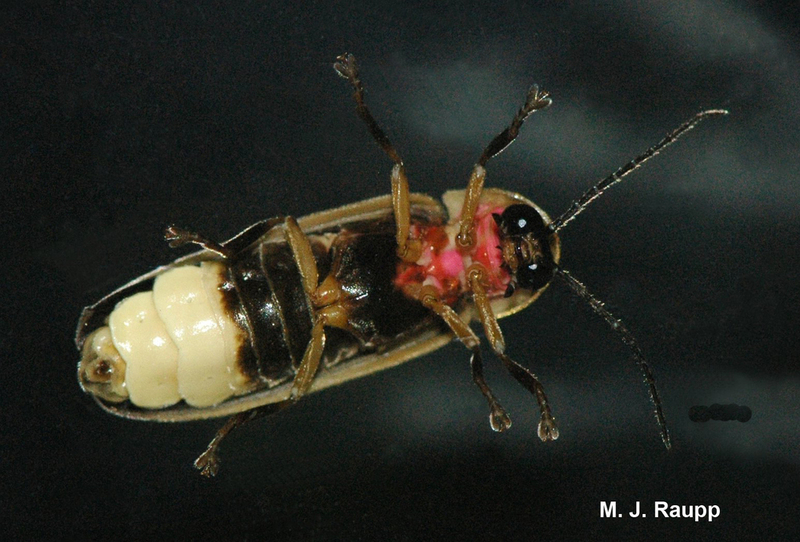 One group of predatory lightening bugs in the genus Photuris exploits the biological imperative to reproduce by taking devious advantage of other species of fireflies. The female Photuris mimics the flash pattern of fireflies in the genus Photinus. When the female Photuris sees the ever-hopeful male Photinus flashing above, she lures him in by mimicking his mate’s flash call. The gullible suitor approaches and, once in reach, this femme fatale captures him and eats him alive. Is this simply a control issue, some kind of gender statement, perhaps? Not really, Photinus lightning bugs produce a defensive compound called lucibufagin that repels predators such as spiders and birds. By eating the male Photinus, the female Photuris has a high quality meal and obtains a dose of chemicals she can use for her own defense. How diabolically clever! While the reason for the renaissance of lightning bugs will be the source of much speculation and perhaps some scientific investigation, we can all delight right now in the annual spectacle produced by Mother Nature’s masters of the lightshow. Happy 4th of July from Bug of the Week. Bug of the Week thanks Shane, Jordyn, Brian, and Bill Vanko for providing the inspiration and technical assistance for this episode. The fascinating studies of Dr. Sara Lewis and Dr. Thomas Eisner and their colleagues served as resources for this Bug of the Week.